Seek To Know The Truth: Against a "Christian Government"
A central tenet of a baptistic world view is the separation of church and state. While many denominational forms of Christianity are more than comfortable with a church/state partnership, Baptists have learned (often the hard way) through church history that when the government and the religion are friends, that friendship usually begets the suppression of religious freedom, which begets persecution of those that believe the only faith which is pleasing to God is faith that comes from the free exercise of religion. In short, even Christian governments eventually persecute Baptists. Thus, if given the choice between living under a deist's democracy or a Christian's dictatorship, the United States in 1800 is to be preferred over Constantinople in 330. If people are born alienated from God, then even those born to Christian parents need to be reconciled to God. That reconciliation comes only by grace, through faith. The act of regeneration is a mystery, but it comes through the preaching of the word, produces repentance, and results in a changed will. Thus the only kind of faith that saves is the kind of faith that changes the will. All Christians believe that, but in church history there has been this constant temptation towards government officially establishing a religion. 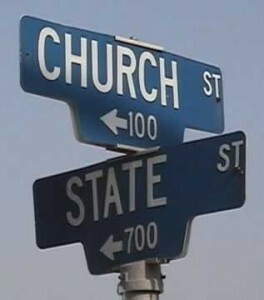 For that to happen, the church and state must be connected. There is no room for the conscientious objector if heavenly citizenship is akin to your earthly one. If the kingdom is spiritual, it must be entered by a person willingly, when his heart is changed and he born again. But when Christianity is compulsory, those marks are worn down. When the gospel is reduced to citizenship, the essential act of conversion is denigrated. It makes sense that OT Israel functioned as a theocracy. If you could be circumcised into a relationship with God, that relationship better include governmental laws, taxes, and (most importantly) punishment for those who transgress the law. Obviously the OT Law was powerless to change the heart, but it was powerful enough to govern a rebellious people. But in the NT, there is no concept of a Christian government. There is no Pauline Epistle on laws or taxes. Government leaders can be Christians, of course. And obviously those who govern with a sense of morality govern better than those who celebrate immorality. But that is not what is meant by a "Christian government." Historically, Christian governments oversee Christian nations, where membership in the church is compulsory, and biblical affections are legislated. The pastors are political officers, and the Queen is the head of the Church. This is not a recipe for elder led churches, or for sermons on conversion. There is a reason there are no Mennonite or Baptist countries in the world. We understand that the gospel in this age does not win, and that the road is narrow (and very few find it!). We understand that not all Israel is Israel, and not all the citizens of a Christian country actually fear the Lord. The lesson from Constantine is that you can baptize people all you want, but if they don't believe in the gospel-if their will is not changed by the power of Scripture-all those baptisms succeeded simply in redefining the word Christian without transforming the soul. This is why the Baptist prizes religious freedom. When people can choose what to believe about God, those that follow the Lord are doing so because their hearts have been changed, not because they receive a tax break. Thus, the system of government that is most beneficial to Christianity is one that is not explicitly Christian. For faith to be real, it must be free, and those that govern towards religious freedom are those that govern best-even if they are not believers themselves. John Piper (in an essay called "Making Room for Atheism") puts it this way: "The spiritual, relational nature of God's kingdom is the ground of our endorsement of pluralism-until Christ comes with rights and authority that we do not have." Religious pluralism in the government is not only a mark of a free society, but aides the spread of the true gospel. This is why the Mosque opening in your neighborhood is a good thing: it demonstrates that in our country, religion is a matter of the conscience. In that environment, those who follow Christ do so because their will has been changed, and not because they have confused their heavenly passport with their earthly one.